This article was originally published at Texas Instruments' website (PDF). It is reprinted here with the permission of Texas Instruments. Recent publicity has attracted the public eye to the development of automated vehicles, especially Google’s experimental cars that have logged thousands of self-driven miles with minimal help from human drivers. These events are truly impressive, and in the long term will help revolutionize vehicle operation and our experience of driving. But the excitement about self-driving cars can make it easy to overlook numerous short-term developments by automotive manufacturers that are equally important in transforming the act of driving. Collectively known as Advanced Driver Assistance Systems (ADAS), these developments are designed to make cars safer, and their gradual introduction is already improving road safety. In addition, ADAS features represent an evolution in vehicle sensing, intelligence and control that will ultimately lead to self-driving cars. ADAS technologies exist at different levels of active assistance and are being introduced in overlapping stages. Driver information systems, such as simple rear-view cameras, surround-view displays, and blind spot and lane departure warnings, provide information but leave the driver in full control at all times. Partially autonomous systems, such as lanekeep assistance and active cruise control, enable the vehicle to control itself briefly in carefully defined situations, but with the driver ready to override automatic control at all times. Highly autonomous systems, including automatic parking valet or impaired driver monitoring and override, will take full control of the vehicle at specific times. These higher levels of assistance employ the technologies used inthe more basic levels, paving the way to self-driving, fully autonomous cars. At this level, the car can operate on its own, with or without someone in the driver’s seat. Volume production of automobiles with fully autonomous control is probably a decade away at this time, although as today’s experiments demonstrate, the essential technology for self- driving cars already exists. However, advanced electronic systems take up much of the space in automated test vehicles and are far more expensive than the cars themselves. To make self-driving feasible for vehicles in series production, the technology will have to be commercialized and made smaller, more light-weight and affordable, a process that can only be accomplished gradually over a period of years. Moreover, there are legal and social hurdles to overcome, which will take time. Clearly, the development, introduction and conversion of the fleet of cars on the road to self- driving will be an evolutionary process that spans a number of automotive generations. ADAS by its nature perfects different aspects of automated control, at first in independent sub- systems, then with increasing levels of system integration, until ultimately the vehicle can drive itself. Evolving these various assistance functions is the job of automotive manufacturers, who look to semiconductor suppliers like Texas Instruments (TI) for innovative technology and solutions. Because ADAS technology is changing rapidly, auto makers need solutions that provide extra performance for system growth, and the flexibility to integrate new features with minimal design changes. ADAS and other automotive systems also pose unusual challenges for manufacturing components, including the need to operate at extreme temperatures, satisfy higher quality, reliability and safety standards and meet stringent cost targets. With its extensive experience in creating products for automotive electronics, TI can help ADAS developers by offering optimized, complete solutions that help simplify design and minimize component counts. As presented earlier, some ADAS features exist in cars today, and others are in development for upcoming models. Information and warning systems have appeared for several years now, evolving into the basic assistance capabilities that are now becoming common as well. For example, many recent models have features that help in backing up. Ultrasound and cameras can extend the driver’s perception, and the car may brake automatically if something suddenly appears behind the car. The camera and ultrasound look behind the car while it is in reverse. Similarly, many drivers can now rely on autonomous acceleration and steering through a combination of front cameras and radar to keep the car in the center of its lane and cruise with traffic, even when speeds are continually changing. Some cars combine ADAS informational features such as panoramic or surround view with the infotainment system to provide owners with a new degree of “infotainment.” Early systems have been introduced with interpretive capabilities for, say, reading street signs or detecting objects around the car, and buyers will see more options in upcoming years. Following a familiar pattern, features like these appear initially in high-end models, then migrate to mid- range vehicles and eventually become available on all new cars. Where safety is concerned, insurance companies, regulatory bodies and legislatures normally become involved, accelerating phase-ins through favorable premiums and legal mandates. In some cases, legislation will be essential to resolve questions of liability and also change existing requirements. For instance, today cameras and interior displays could replace external rear-view mirrors, not only enhancing safety by eliminating the treacherous blind spot, but also streamlining the car’s profile for improved gas mileage and reduced carbon emissions. However, since existing safety standards often mandate car mirrors, regulations must be changed to permit these improved replacements. The first changes of the legal framework to allow cameras instead of side view mirrors—called camera monitoring systems—have already been rolled out in a few countries. The European NCAP system gives star ratings, for example, in blind-spot monitoring and the U.S. NHTSA has mandated that all new vehicles must have rear view cameras by 2018. Security is also a concern as cars begin to communicate with each other and with installations along the roadway. However important it may be for automated vehicles to establish these communications, they also will need protection from malicious intrusion. These issues are not technically insurmountable, but they also involve legal and social adaptations that cannot happen overnight, and functional safety standards that auto manufacturers must adhere to will need to be established. Manufacturers will need to rely on semiconductor and equipment providers to produce parts that auto manufacturers can use to get their end products easily and quickly certified and into market. The evolution of ADAS technology involves several areas of innovation. Two important related trends include shrinking individual components such as sensors, cameras and electronics, and integrating dedicated functions into more comprehensive systems. These trends are complementary because smaller, less expensive components are needed to build larger systems affordably. For example, the same front camera that serves for lane-keep assistance can also provide information to detect objects in front of the car, read traffic signs or apply the brakes to avoid a crash. However, performing more complex ADAS functions requires not only input from more cameras and from other sensors such as ultrasound, LIDAR and radar, but also the fusion of data from those different sensor elements. Fusion also enables overcoming the drawbacks of individual sensor solutions and can provide some level of redundancy. Figure 1. Sensor fusion technology. More sensors and more cameras with higher resolution all translate into requirements for high- bandwidth communications and high-performance processing. Currently, different networking standards and topologies are used for ADAS. Whatever the ultimate standards become, it will be crucial that few wires are used to minimize weight and installation time. Latency must also be low to ensure efficient delivery of critical data. Optimized networking that allows video and other data, control signals and even power over a single wire, significantly reduces requirements for weight and connector size, thus reducing space in the modules themselves, as well as the weight of the wiring harness. Video processing is another area of ADAS advancement, forming the bulk of the work because of the massive amount of pixel data that cameras produce. Initially, the system has to filter and condition the succession of video images, then identify areas of interest. Next, the system has to recognize items such as stop signs, pedestrians and other vehicles, and then decide what to do. Each of these time-critical tasks serves to narrow the data stream while increasing the algorithm’s complexity. 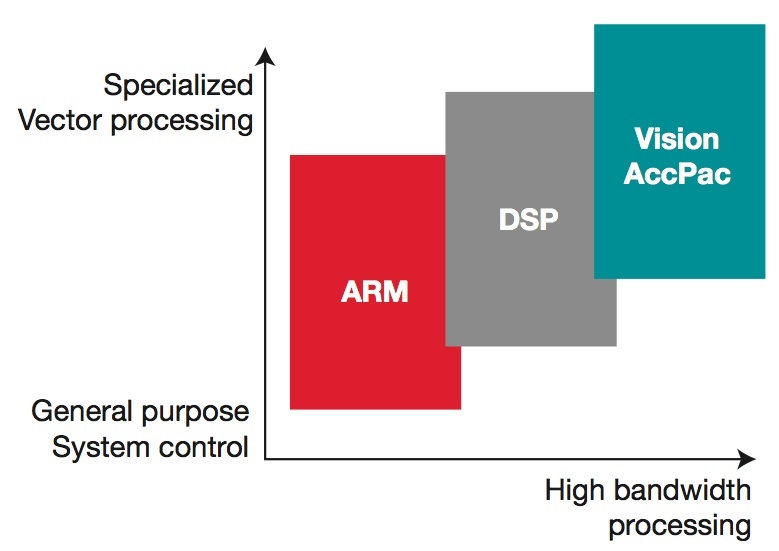 As a result, the system requires heterogeneous processing, ranging from dedicated video signal processing hardware for the raw data input, through programmable signal processing for object scanning and recognition, to a high- performance microprocessor for decision-making that affects vehicle operation. Image processing requires that as many of these heterogeneous processing elements be together as possible, along with the fast communication interfaces that supply camera data to the processor. Besides flexible communications and heterogeneous processing, ADAS systems rely on integrated, adaptable power management. Automotive voltages vary over a wider range than do those of most electronic systems, and the operating environment can be extremely stressful in terms of temperature range, vibration and contamination. Power management solutions are especially important, not only because they supply reliable power for the operation of other devices, but also because they offer important protections that help prevent damage to systems. Robust power management is all but invisible to users, but system developers know that it is absolutely essential in the evolution of ADAS technology. ADAS system developers can rely on TI to offer solutions for their technical requirements. Given the needs of ADAS technology, developers require innovative solutions that offer affordability, flexibility to adapt to changes, reliability to meet the extreme conditions of automotive operation, and sufficient performance for future growth. Add to these advanced integration and packaging capabilities with both analog and digital functions, in-depth design support, and reliable supply in the regions where auto makers operate. Given these requirements and the exacting standards imposed on automotive suppliers, TI is well poised to deliver the full range of products that auto makers rely on for ADAS innovation and development. 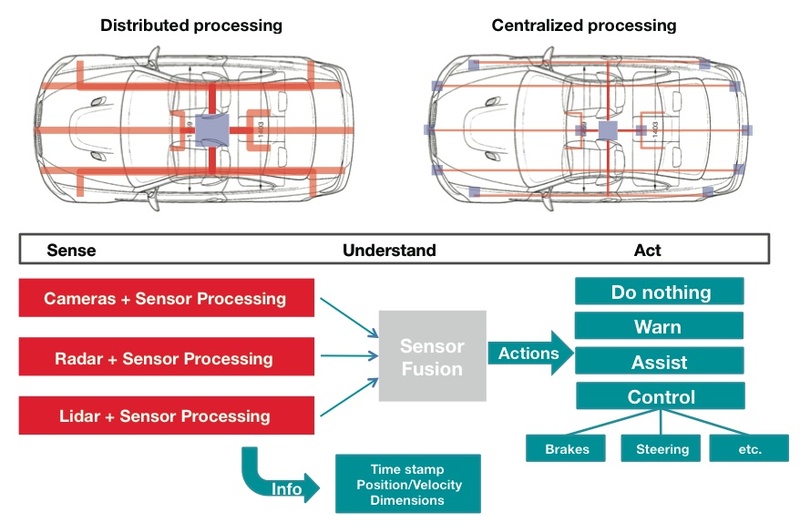 The most complex of the specialized products required is the high-performance application processor at the heart of ADAS camera-based sensor and fusion, as well as some radar-based, features. Called the TDAxx system-on-chip, this solution integrates a wide range of functions to perform its heterogeneous tasks effectively. It was designed specifically for advanced vision processing and control and optimized to achieve the best balance among performance, power consumption and cost-effectiveness (Figure 2). The TDA2x enables high-end ADAS video systems, while the TDA3x is targeted at entry-level and space- constrained systems. Figure 2. As complexity increase, specialized vision processing maximizes performance and power efficiency. These products integrate a general-purpose dual- CortexTM-A15 RISC processor, dual C66x DSPs, and a programmable Vision AccelerationPac. One or more specialized hardware Embedded Vision Engines (EVEs) in the Vision AccelerationPac enables it to deliver up to eight times the computational performance of the RISC per unit of power. This frees up the DSPs and RISC cores to handle mid- and higher-level algorithms specific to the ADAS task. TI’s innovations incude a Vision Software Development Kit (SDK) to enable rapid algorithm prototyping and fast creation of different data flows involving video capture, video preprocessing, video analytics algorithms and video display. TI fully integrated set of peripherals into the TDAxx solution to simplify design and minimize space, thus facilitating sensor fusion (Figure 2). Communication interfaces, especially for camera-based systems like surround view and back-up camera, benefit from TI’s latest generation FPD-Link III SerDes family, which helps reduce the effort to connect remote ADAS satellites to central processing modules to a single coaxial cable. Reduced wiring effort and smaller modules due to smaller connectors and highly integrated components help ensure that the ever- growing number of sensor modules for ADAS is not burdening new cars with high extra cost and weight. The ongoing evolution of networks in automotive systems, such as Gigabit Ethernet for automotive, will demand in-depth expertise in developing solutions for various types of communication. Heterogeneous processors function with different voltage levels in the same device, and external devices may have different voltages requirements as well. Power management ICs must be able to supply steady, reliable voltages from the car’s variable battery power while protecting against power surges and voltage transients. TI’s power management advancements and solutions allow automotive electronics developers to select the appropriate power management devices for their ADAS systems. The company’s high-performance processing, communications and power management products are supported by long-term experience in creating solutions for the automotive industry. While self-driving cars are still in development, advanced driver assistance is with us today and rapidly increasing in importance. Current models are starting to move beyond information and warning systems. However, the changes will come incrementally, as ADAS features become smaller, easier to integrate, and more affordable. Moreover, the technology can’t move forward on its own: there must be accompanying legal and social advances. 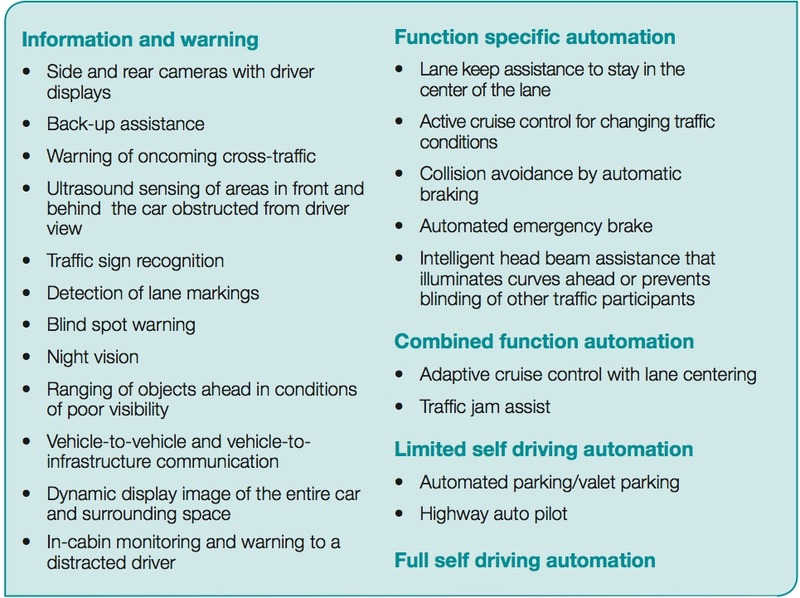 All of these factors are leading us toward cars that operate on their own, and all are necessary for the ultimate success of fully automated vehicles. TI is driving innovation to reduce the size, weight and expense of ADAS features while adding ever-greater functionality, often by integrating previously separate functions into the same silicon or package. High-performance, heterogeneous video processing, flexible communication interfaces, and efficient, protective power management are three of the most important areas of advancement. TI advancements are also enabling extensive integration and packaging capabilities for both analog and digital technologies, and in-depth design and manufacturing support proven through long-term relations with key players in the automotive industry. Together these advancements will push ADAS forward and will eventually enable automated vehicles.